This entry was posted on Saturday, October 1st, 2011 by Frances Ryan. 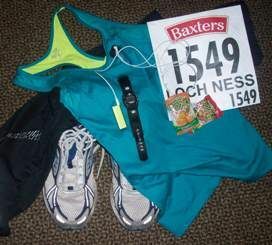 I’m running my first—and last—ever marathon in the morning. I’m pretty excited about it, but at the same time I’m rather dreading it. You see, I don’t actually enjoying running exceedingly long distances. 10Ks and 12Ks are fun. Heck, even the occasional 10-miler or half marathon would be an exciting race to train for. But a marathon is 26.2 miles and is simply too long to enjoy. Of course, that statement makes one wonder why I’m going through this torture in the first place. So, let me tell you! I am running a marathon in the morning because Paul didn’t; because Paul can’t; because Paul died about a month before his first marathon. When we first met, Paul was anything but athletic. Then, shortly after we got married, he decided to join my gym with the caveat that it was a one month trial—and the insistence that he would hate it and quit. In fact, in the first week or so I thought he would! But then he found the treadmill and was pretty excited about that. 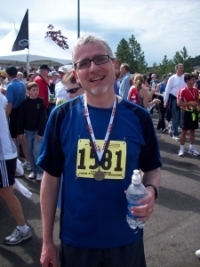 A few weeks after finding the treadmill at the gym, Paul set a goal to run a 5K. But he would never run more than that. Then I mentioned the Spokane Bloomsday 12K and he was uninterested (too far, you understand) but eventually he changed his mind and ran that. But he would never run further than that. Then he ran his first half marathon. And then he started to talk about how he’d like to run a marathon before he was 50. So when he decided—at the age of 47—that he was ready for that first marathon, I smiled. After all, he only ever wanted to run a 5K! Paul loved running. It became a true passion in his life and he was good at it. And he trained and trained for the marathon—he even ran whilst we were on our last holiday to England. Paul died a week before what would have been our third run at the Bloomsday 12K—and a month before the Coeur d’Alene (Idaho) Marathon. The Bloomsday 12K took place the day after his funeral, so there was no way I could have done it, but at the time I felt this odd need to run (or at least walk) the marathon for him. But that was silly since I could barely stand on my own two legs for the first few months after he died. In fact, I gave up running all together for quite a while after he died. Anyhow, I eventually got back into running again and felt the need to run a marathon before what would have been his 50th birthday. And that would be this November, so I needed to get in gear and start training! Of course, I am not really in shape for this adventure. I don’t have the stamina to run that far. Between my blood condition and kidney disease (and pure laziness), I’ve been struggling with getting the training in and maintaining my health. In fact, often times I can hear Paul yelling at me about how a woman ‘in my condition’ ought not be running a marathon. I can also hear him nagging me about getting my training in and about how I need to be careful not to make myself sick and about how I need to eat my breakfast—especially on training days—and that I need to remember to cross-train. But, as Paul well knows (knew?) I am stubborn and when I say I’m going to do something, I do it. So that’s why I’m running. I’m running for Paul. But since running for Paul makes me feel happy, I suppose that I’m running for myself, too. Good luck Frances! There is no doubt he would be proud of you no matter what! You are so inspiring to me, in so many ways! I can’t imagine running this distant, but I know you are stronger than even you know! I can’t wait to hear about it!!!! !